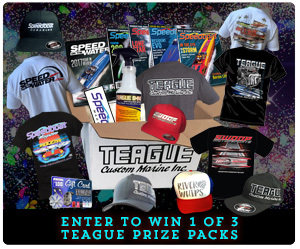 Teague Custom Marine is proud to be hosting a Teague Prize Pack Giveaway Contest! Enter for your chance to win a Teague Custom Marine gift certificate, Teague swag, and some of the hottest boating swag in the industry from our participating colleagues. The contest will run from June 1-30, 2018, so act now. Start the summer season off right! These are the wonderful Teague Custom Marine and other sponsored Prizes you could win when you enter today. • Grand Prize: $150 Teague Custom Marine Gift Certificate, PLUS Items below. Only one entry per person will be counted and the contest is only open to U.S. residents, ages 18 and up. When entering the contest, a valid email must be provided and is subscribed to the Teague Custom Marine email subscriber list. Unsubscribing or changing preferences may be done thereafter if desired. Three winners, a 1st, 2nd, and 3rd place, will be chosen at random on or about July 2nd by Teague Custom Marine staff and will be directly contacted shortly thereafter. This contest and selection of winners is done at the sole discretion of TCM. Most prizes will ship directly from Teague Custom Marine, yet some might be coordinated and delivered by our other sponsors. Keep an eye out for our announcement of the winners and good luck! Teague Custom Marine is your #1 source for all performance marine engines, parts and accessories, being the largest marine distributor, also offering worldwide shipping. Keep in touch! Click here to sign up for our mailing list and receive exclusive special offers from Teague Custom Marine, and like our page on Facebook to keep up with the latest from Team Teague.